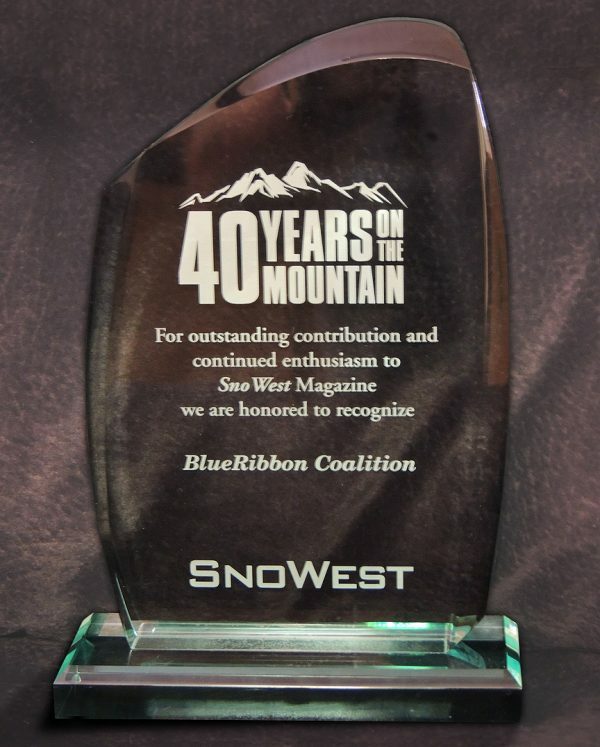 GOLDEN, CO (February 17, 2015) — On January 30th and 31st SnoWest Magazine hosted a major event to Celebrate 40 years of the magazine’s history. The weekend featured a number of events and brought several hundred riders to West Yellowstone. The attendees came from all over the U.S, and Canada. The included a number of fun activities, such as demo rides of the latest snowmobile models, a poker run, a donation ride challenge, vintage snowmobile races, a video contest and much more. The SnoWest 40th Anniversary event culminated Saturday afternoon with a SnoWest Recognition Awards Ceremony held in the Union Pacific Dining Hall. The event, attended by several hundred snowmobile enthusiasts highlighted those individuals, organizations, businesses and governmental agencies that had made significant contributions to western snowmobiling over the past 40 years. Jack Welch (foreground), BRC Vice President, rides along on one of the many activities at the event to celebrate 40 years of the SnoWest history (photo by Steve Janes, SnoWest Magazine). Those receiving the Outstanding Lifetime Contribution Awards included myself and Kay Lloyd. The Award reads “Forty Years on the Mountain – For outstanding lifetime contribution and continued enthusiasm…” When I was presented my award, Steve Janes thanked me for my efforts as Past President of BlueRibbon Coalition (BRC) in ensuring that snowmobilers continue to have the opportunity to visit Yellowstone Park in the Winter on non-commercially guided trips. 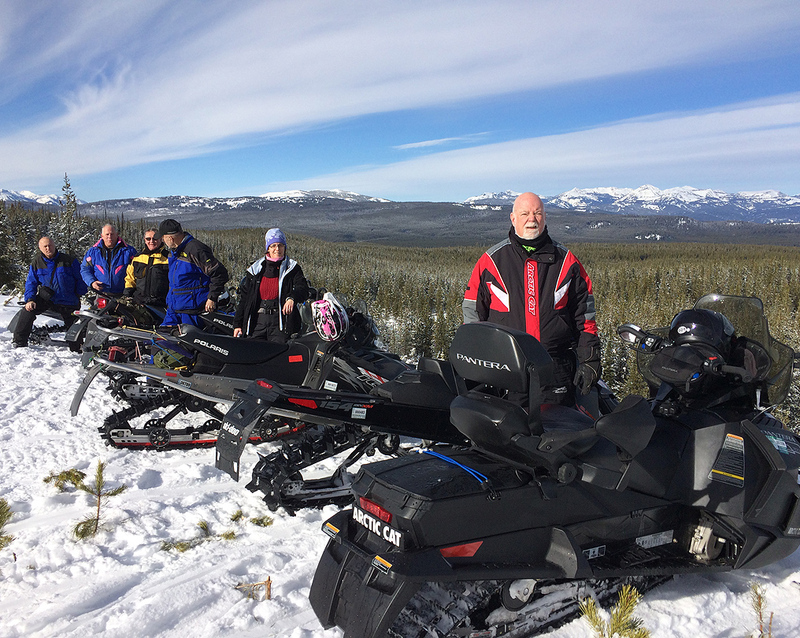 BRC Board Member, Kay Lloyd, was recognized for her efforts in organized snowmobiling in Washington State and Western U.S. Additional snowmobile leaders from snowmobile businesses, industry and governmental agencies received recognition also. Outstanding Contribution Awards went to the BlueRibbon Coalition and additional individuals, businesses, snowmobile clubs and governmental agencies from the region. It was an honor to be recognized and to accept the awards, as an individual and on behalf of the BlueRibbon Coalition. Many thanks to SnoWest Magazine for presenting these awards, and recognizing our efforts on behalf of over-the-snow recreation. The BlueRibbon Coalition (BRC) is a national non-profit organization that champions responsible recreation and encourages a strong conservation ethic and individual stewardship, while providing leadership in efforts to keep outdoor recreation alive and well — all sports; all trails. With members in all 50 states, BRC is focused on building enthusiast involvement with organizational efforts through membership, outreach, education and collaboration among recreationists. 1-800-BLUERIB – www.BlueRibbonCoalition.Org.